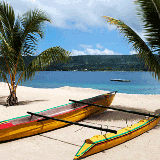 Arch RoamRight offers travel insurance for U.S. residents traveling to Vanuatu. Whether you need travel insurance to help protect the expenses you’ve paid into your vacation, or short-term travel medical insurance while you’re in Vanuatu, we have several travel insurance plans for you to choose from. Get started by completing our quote form above. Whether you choose to relax on a soft sand beach or explore the volcanoes, waterfalls and remote villages, Vanuatu is a country that is diverse and unique. From the locals who live in the most primitive of villages to those who reside in the capital of Port Vila, Vanuatu has some of the friendliest people in the world. Their love of their country, unique tribal traditions and carefree attitudes make visitors feel like they’re a part of the community and instantly at ease. English is an official language, as is French, but the deeper away from the cities you go; the more you’ll hear the Creole and ancient languages that make up this culture. Regardless of where a local is from, they are always willing to help. With ancient customs such as craft making and land diving still practiced in Pentecost, visitors can find a lifestyle unlike any other. Modern adventures like abseiling or diving are also very popular with unique outdoor opportunities on every island. Lodging in Vanuatu ranges from budget guesthouses that overlook the ocean, to bungalows built over turquoise lagoons with glass bottom floors to watch the underwater world go by. Jetting off to your next island is easily possible, with ferries departing almost daily but nearly never on schedule. Just ensure to pack your relaxed pace to match the locals. Dive the Blue Caves of the rugged north coast. Observe the land divers, the birth of the bungee jump that has young men plummeting into the earth all in the name of a good yam harvest. Watch as fiery lava expels from Tanna, the world’s most active volcano. Tap with the beat of the drum, as you watch the cultural dances on Malekula. Find your own picture-perfect paradise beneath the shade of a palm tree on a white sandy beach. Float along the underground rivers in the cave systems of Luganville. Explore the giant Bayan trees, with one the size of a soccer field in Lenakel. Eat a lap-lap, a traditional root cake cooked with hot stones. Drink the local cocktail Kava, straight out of a shell.